I’m unable to find the comparative data for this year, but I’d like to revisit the topic anyway. My initial reaction to the challenge was that there might be an increase in demand during the summer months, which could explain the jump. Looking at the above graph now, I’m wondering if the slide well before September (when most kids go back to school) illustrates collapsing demand. After all, employment starts to drop before the temporary supply heads back to school – doesn’t that suggest demand’s importance? So, does employment drop before supply dries up and, if not, isn’t it difficult to say which is the cause? Frankly, I’m not sure why extra supply by itself would cause a spike in hiring. 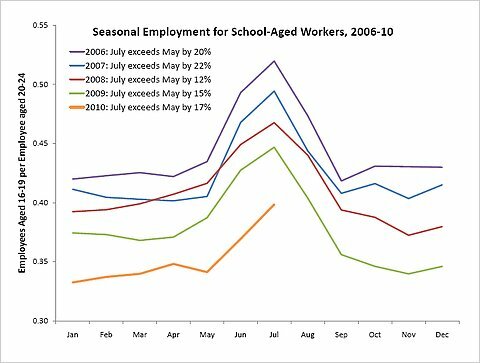 Teenage employment -even in the summer- continues to decline every year. The graph shows employment of 16-19 year olds go up relative to 20-24 year olds, but why wouldn’t unemployed 20-24 year olds be willing to fill available jobs? If it was only supply rather than increased summer demand, why wouldn’t businesses hire the unemployed workers in non-summer months? 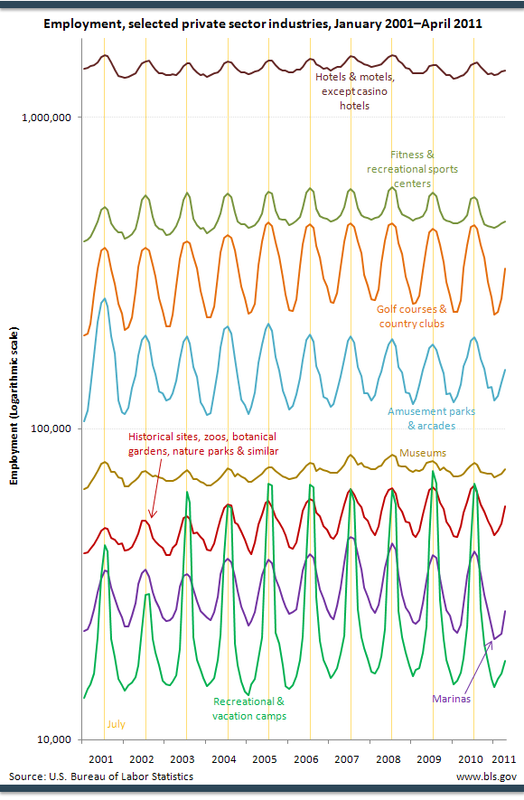 For example, are hotels going underemployed during non-summer months? Is there any evidence that the unemployed are refusing to work in large numbers? If you examine the character of seasonal youth employment it seems to suggest increased demand could be causing the boost in hiring. The industries that see rises in summer employment are the same industries that see increased demand. Think recreation and vacations. Meanwhile, schools and daycares experience decreased employment because people don’t need their services. The reason we see more 16-19 year olds relative to older age groups hired is that if business are going to hire workers to fill the temporary rise in demand they are still more likely to want the lowest cost workers. Nothing about that seems inconsistent with rising demand. Whether it is increased demand or increased supply (or both) that causes the change in employment, I can’t say for sure. But, Mulligan’s claim that increased worker supply causes the employment spike may confuse correlation for causation. Either way, I’m willing to try anything that might help our employment crisis. I suppose that means expanding immigration into the US to increase the supply of workers and to reignite our efforts to generate more demand. Is Castrating Males A Good Idea?